When you’re upgrading from 1080p, you’ll quickly discover there’s more involved with improving your resolution than buying a new screen. 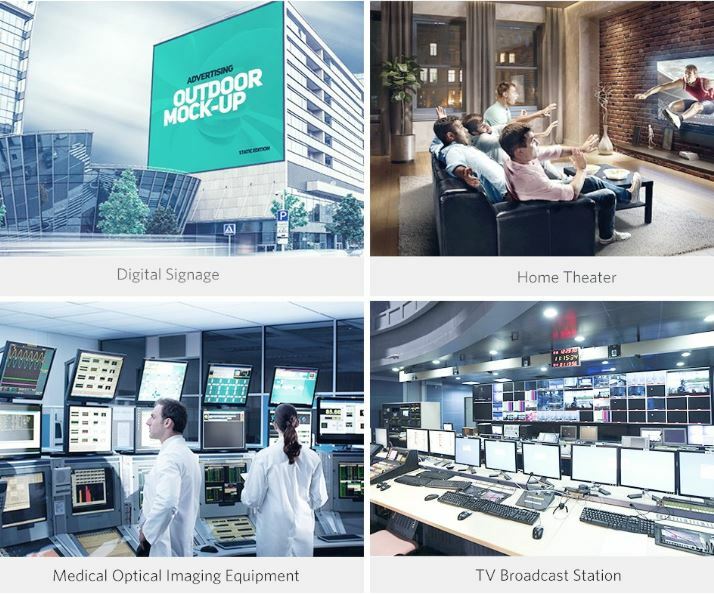 In order to move to UHD resolutions, or adopt features like HDR, every component involved in your system needs to be compatible with that feature. From the display you’re using to the content you plan on playing, everything has to line up. Even your HDMI cables. Actually, HDMI cables are easily the most commonly overlooked aspect of creating a modern UHD home theatre. Sadly, people occasionally develop false impressions about the clarity of their own TV because they’re using the wrong cables. It’s tragic when a fancy TV underperforms because of something so trivial as using the wrong wire. But it happens all the time. All of this confusion can lead people to waste money on cables that are far greater than what they really need, or lead them to a cable that doesn’t actually meet their needs. Luckily, finding the right cable isn’t all that tough, unless you want a flat one. As early as 2009, HDMI 1.4 cables began to be circulated. That format allowed support for 4K content, as well as ARC and Ethernet support. But the older 1.4 format doesn’t have support for a number of features that many people consider essential for a great 4K presentation. HDMI standards have continued to evolve over the past few years, and they will continue to evolve in the future. Some of the earlier formats don’t have abilities which are critical for carrying 4K content. 4K content requires an enormous quantity of bandwidth because it’s basically four times as much information as HD content. You need to keep your eye on two versions of HDMI. One is version 2.0a and the other is version 2.0b. Both offer support for HDR content. You really only have to start picking hairs between them if you intend on operating at higher refresh rates. While most 4K content operates at either 24FPS or 30FPS, higher framerate content is an increasingly popular trend. Console gamers may want to notice the Xbox One X has decided to establish 60fps as the standard framerate for its 4K content. Which actually brings our attention to an upcoming version of HDMI called HDMI 2.1. It’s supposed to enable HDR with improved refresh rates. It’s also supposed to expand the bandwidth of the cable. For the moment, there’s no content out there which requires HDMI 2.1, so you don’t need to hold your breath and wait. There’s no way to get around it, fiber optic cables are more expensive. That makes them a bit more of an investment, and makes it more worthwhile to pay attention to the quality of their build. Cables will gradually wear out. Cheap cables will do it faster than well-made cables. It seems likely that eventually, even HDMI 2.1 will be considered an older format. That day may or may not come, but we can be certain HDMI 2.0 cables ought to see nearly a decade of use. Wear-and-tear also increases if you plan on moving or touching the cable. If you basically plug-in the cable and leave it alone forever, then you don’t have to be gravely concerned about build quality. You still want to search for gold plated connection terminals, or something equally resilient against corrosion. That way, the connection holds up well over time. When you’re transmitting data over a wire, you generally want the wire to be only as long as necessary. Because the integrity of your signal will invariably drop with lengthier wired connections. It doesn’t hurt that shorter cables tend to be a bit cheaper, too. This is less of an issue with fiber optic cables because they’re magnificent at transmitting information over greater lengths. It’s also the only reason to consider a fiber optic cable over a traditional cable setup. 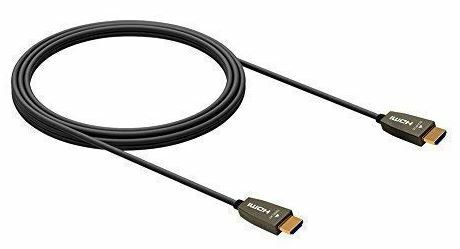 Consequently, it’s not too uncommon to find effective HDMI cables that exceed 100-feet in length. What’s the difference between a $10 HDMI cable and a $150 fiber optic cable? Both cables are carrying a digital signal which is intended to reach your screen. Analogue signals degrade very easily, but digital signals are more like binary. They either work or they don’t. You really only need to switch to fiber optic cables under one of two scenarios. The most common scenario being that you’re trying to get around the length restrictions of HDMI cables without losing signal integrity. And that really only affects people who are at or exceeding about 25-feet of connectivity. It’s a little lengthier for older formats of HDMI, as far as 50-feet. Though they’re worth a glance, be skeptical of certifications. You want a high-speed cable, but a cable calling itself high-speed doesn’t actually tell you that much. It’s possible a cable was certified back in 2010 against a lower standard. 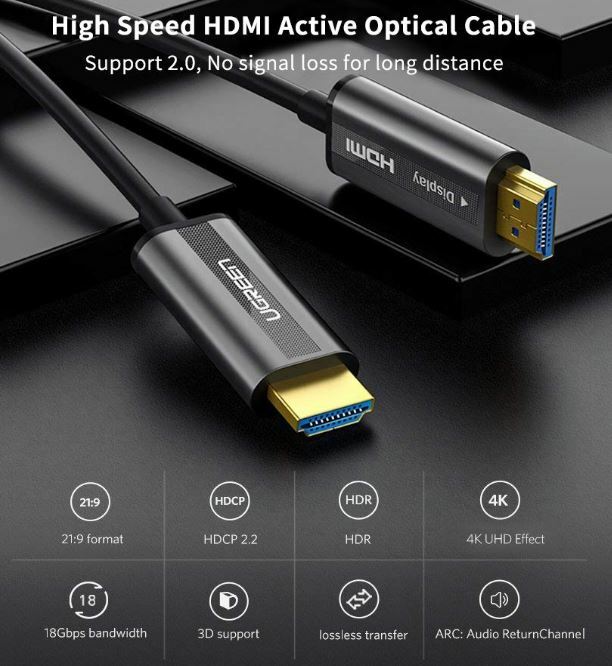 Because you don’t want a high speed 1.4 cable, you probably want a high speed 2.0 cable. And since certifications aren’t super reliable, you really have to dive into the gritty details for yourself. UGREEN are basically cable and adapter specialists. They make quite a few cables that pay attention to the right details, but rarely do they delve into fiber optics. However, it’s entirely due to the fiber optic build that this cable is capable of running 60Hz and 4K resolution across such great distances. It also covers the essentials, including 18Gbps bandwidth, which allows full support for 4K with HDR and 12-bit color. That makes this cable optimal for the PlayStation 4, the upcoming Xbox console, and basically any UHD TV. The UGREEN HDMI Fiber Optic Cable is available in 33ft, 50ft, and 65ft. The fiber optic version of an HDMI cable is approximately 45% thicker than the original HDMI cable. Part of that is the cabling itself becoming larger, which has to do with ensuring bandwidth stability. Part of it has to do with extra layers of protection for the cabling inside. The cable is constructed with a fairly durable TPE jacket. You wouldn’t want to let animals chew on it, but unless someone was intentionally trying to break the cord, it ought to hold up pretty well. Even to bending forces because underneath that, there’s a Kirstie shell. And past that, gold plated connectors. Those connectors were chosen in the interests of rust resistance and connection stability. The connection terminals for both ends of the cable are both plated and protected more than adequately, and without becoming bulky. The connections themselves are fairly low-profile, barely raised a couple millimeters above the end of the connection. Because these connections are low-profile, they’re less likely to interfere with other devices being plugged in. That seems like a minor inconvenience until it means you’re unable to use one of your other connections. This cable allows for 3D video in 4K, with a 40Hz refresh rate. It’s backwards compatible for 2K content at 60Hz, and 1080p content at 144Hz. It’s certified with FCC, CD, RoHS approval. 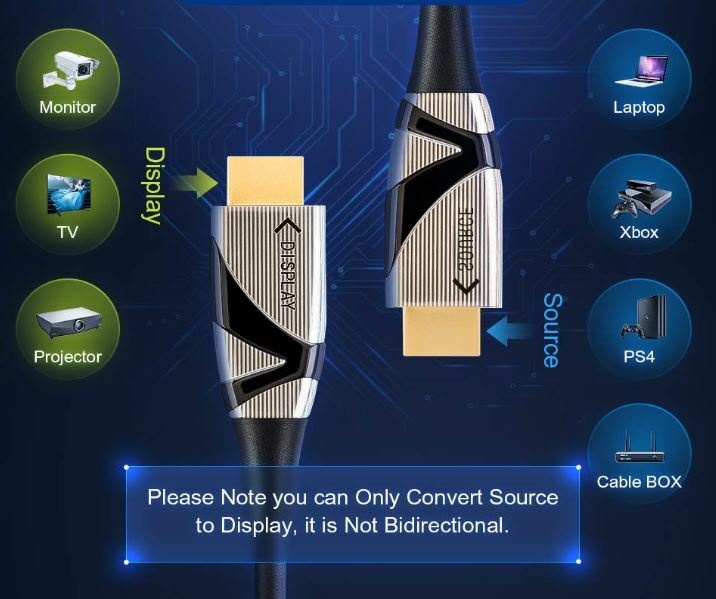 As an HDMI 2.0 cable, it supports Dolby 7.1, and ARC. Additionally, it doesn’t hurt this cable includes an 18-month warranty from UGREEN. But as cable specialists, you generally don’t have to worry about defects leaving the warehouse. 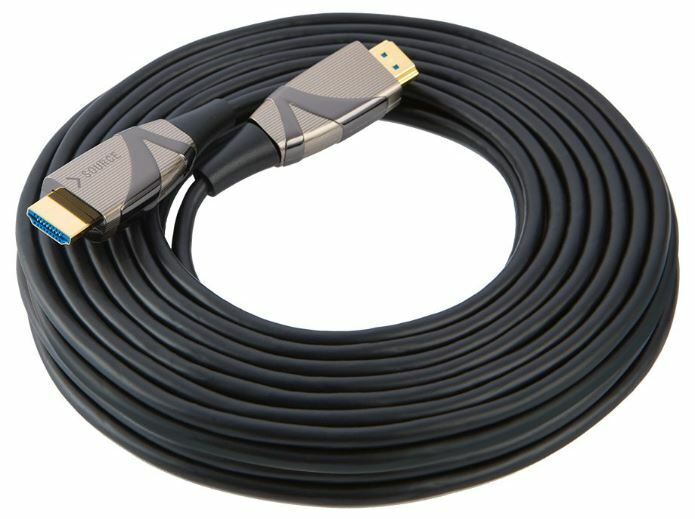 The CableCreation HDMI Fiber Cable offers just about everything you’d want from a 4K cable. It supports 4K content at 60Hz, making it ideal for upcoming generations of 4K gaming content. UHD support aside, it can handle chroma subsampling without a hiccup. It’s available in three sizes, 20ft, 33ft, and 49ft. But it’s really the 20ft option that stands out. Interestingly enough, CableCreation decided to make their fiber optic cable in an ultra-slim design. But it only looks slim when you’re comparing it to other fiber optic HDMI cables. The cable is built around a zinc allow plug, and an optical fiber core. So when you’re comparing it to a typical HDMI cable, its thickness looks closer to average. That makes it sound strange when you call this a slim cable, but it really is. The gold plated connection terminals help prevent corrosion from interrupting the integrity of your signal, and like with the UGREEN cables, the connections themselves are pretty low-profile. When you have this cable plugged in, it doesn’t have enough of a body to actually block anything above or beneath it. CableCreation includes a two-year warranty with their HDMI Fiber Cable. You probably won’t need the warranty because these cables get tested before they’re shipped, but it’s a nice extra assurance. As you’d expect from any fiber optic cables on this list, RUIPRO cables support all the essentials, and then some. That includes full chroma subsampling support, 10-bit color depth, and the 18.2Gbps bandwidth necessary to bring 4K content to life. Additionally, it supports HDR, CEC, 3D, and EDID. It’s even HDCP 2.2 compatible for streaming. But once again, it’s really size that helps distinguish these cables. RUIPRO HDMI Fiber Cables are available in a wide variety of sizes. They have shorter 10ft cables, and massive 150ft cables. There’s also more than half a dozen different intervals between those two options, which makes it pretty easy to find a cable that’s almost perfectly sized for your application. RUIPRO cables are actually the longest cables on this list by far, and some of the longest cables on the market. At least, excluding poorly constructed alternatives. 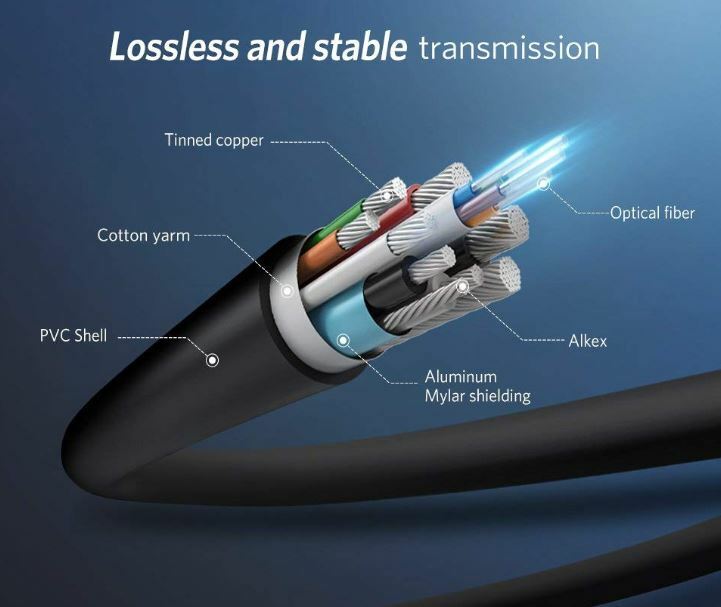 The thoroughly shielded design of the cable and its fiber optic nature ensures there isn’t any signal loss for high noise environments. The fiber optic itself was made from pure glass fiber and oxygen free copper. RUIPRO includes a two-year warranty with their cables. But once again, if you don’t encounter an issue immediately, it’s incredibly unlikely you’ll encounter an issue in the following two years. These cables aren’t exactly value-oriented. But it can be tough to find cables that come anywhere near this length, especially without paying extremely high prices, or having to deal with specialty retailers. 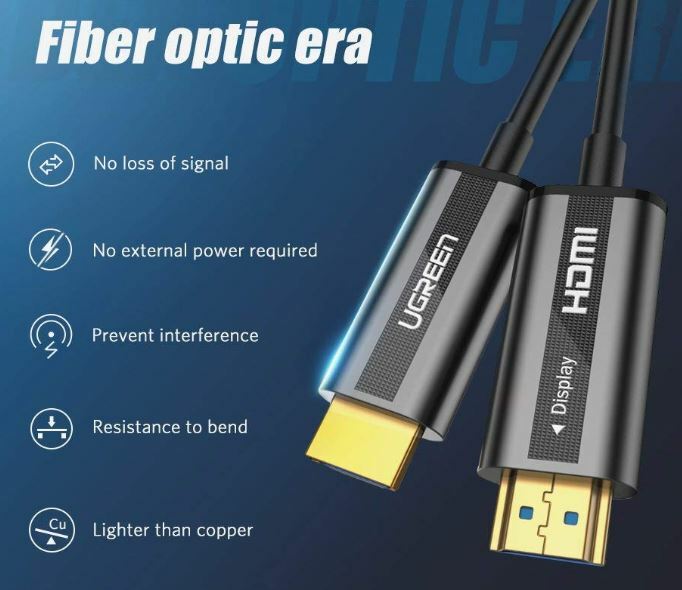 The UGREEN HDMI Fiber Optic Cable is a good choice for someone who’s looking for quality above all else. The cable is slim, well designed, and it’s everything you’d expect from a company that specializes in making cables. 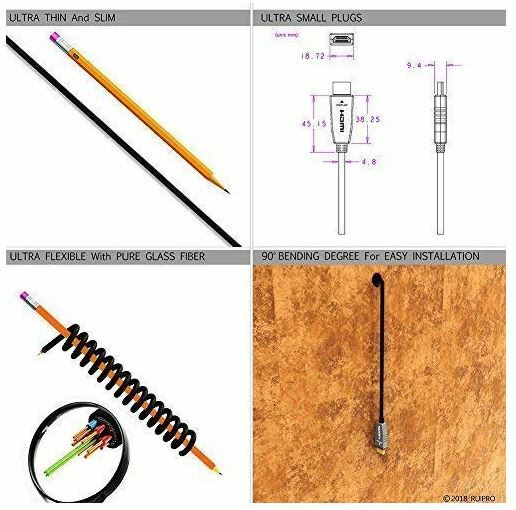 Their size options are suitable to most installations, though starting at 33ft and moving upwards, there is some emphasis on lengthier cabling. The CableCreation HDMI Fiber Cable is a good choice for someone who’s looking for a budget-oriented option. The cable doesn’t cut corners and is built pretty well, plus it has size options which are more suitable to people working around 20 feet. Though it’s actually arguable that you’d need fiber optic cables for that kind of distance, the CableCreation HDMI cables are a good choice for someone who’d rather be safe than sorry when it comes to signal integrity. 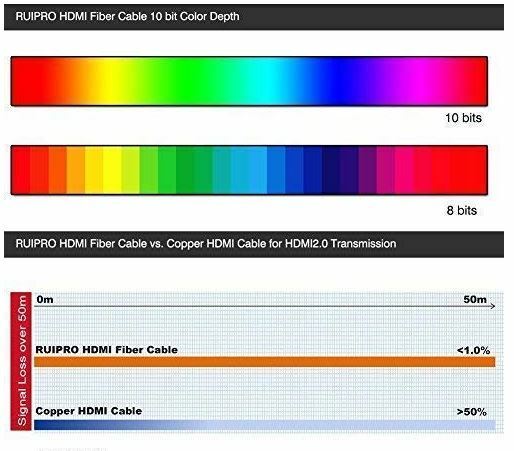 RUIPRO HDMI Fiber Cables have the most size options, but many of them really don’t make sense. In most circumstances, it’s really unnecessary to use a 10ft fiber optic cable. But they also have some of the lengthiest cables you’ll find on the market, running out towards an amazing 150-feet. 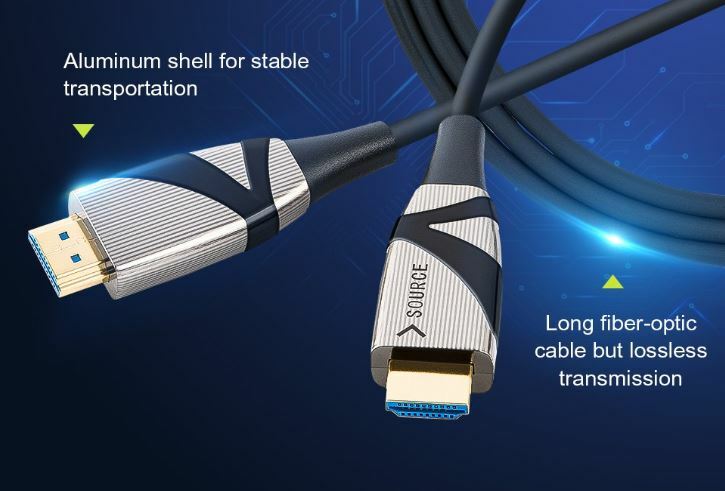 Moreover, these cables are also especially thin and flexible, and they have wide support for all the features HDMI 2.0 can bring to the table. That makes RUIPRO cables a sharp choice for someone who needs enormously lengthy cabling.